As promised on Twitter last week, here's Chris's article on getting Railo running on Rasperry Pi. So you are a lucky owner of a sweet Raspberry Pi, you have a typical broadband connection, some ColdFusion language skills and you would like to take advantage of all these things and roll out a little Web site hosted at home, independently from any hosting provider, and make it available to your family, friends and the rest of the world? That's exactly what I've done and I thought I'd share a step-by-step guide on how my stack has been set up so you can give it a try, amend it and/or improve it. The guide is inspired by an excellent article by Glyn Jackson on running Railo on Raspberry Pi that I found very useful when I started this exciting journey. However, the set-up described below differs slightly as the current version of Raspbian does not allow to install the official Oracle Java JDK and for that reason I'm going to opt for OpenJDK instead. And also, we don't need to worry about the SSH configuration as it's enabled by default in more recent versions of Raspbian. Another deviation from Glyn's config is using a wired Internet connection rather than WiFi. If you are in the UK, it can be BT, Virgin or any other popular async broadband option (and if you are lucky enough to have an Internet connection with a static IP address, you might want to skip the section covering Dynamic DNS). I tested it with an Apple TimeCapsule and a BT HomeHub but other routers should provide that functionality as well. I haven't tested it on the 256 model but you might like to do it at your own risk. A step-by-step guide covering this topic can be found on the eLinux site. You will need direct or SSH access to the box with root permissions. Tomcat 7 Jetty, Resin etc. Railo 4 jars Earlier version of Railo, Open BlueDragon (not confirmed). Adobe ColdFusion is unlikely to run on such limited hardware. One of the great things about Raspberry Pi is its low power consumption which means having it always on should not ruin your home budget. I'm no expert on the electricity stuff but I'm powering my Pi through a USB cable hooked to the Apple TimeCapsule which acts as our home router and is always on anyway so that means there are two devices plugged to one wall socket. Does this configuration mean a decreased power consumption? I honestly don't know but it's certainly nice to have one extra power socket available. In my case, the Pi is connected to TimeCapsule with two cables as the wired Internet connection is also coming from it (see the picture below). OK, so now when our Pi is powered on and it's connected to the Internet, let's make sure its IP address on the local network is not dynamically assigned through DHCP but is static instead. This is to enable it to configure the router to forward Internet traffic to Raspberry Pi that we're going to focus on a little later. It's time to access the Raspberry Pi's shell and this can be done either via SSH or directly as long as you have a keyboard and a monitor attached to the board. If you're on the Mac or Linux, just fire up Terminal and type the commands below; Windows users will need to download a tool like PuTTY in order to interact with their Pi. The second command takes care of installing the OpenJDK Java stack and the Tomcat application server with its admin console. Please note we're also using the --no-install-recommends flag to ensure no optional software is installed. Interestingly enough, the version of Java installed after running the command above is 6, not 7. I never had a chance to get to the bottom of that but I suspect this is down to the Tomcat package dependencies that favour version 6 over 7. Now when we have our Java stack in place, let's download the Railo CFML server. At the moment of writing this article, the current version of Railo is 4.0.2.002. For performance reasons we are going to serve static content via a Web server and only get Tomcat to handle ColdFusion files and hence we also need Lighttpd. Lighttpd is my favourite lightweight alternative to the famous Apache server that seems to be a perfect choice when you have limited hardware resources as is the case with Raspberry Pi. What we are going to do here is make Railo libraries available to Tomcat, add the Railo servlet to it and make sure .cfm and .cfc files are handled properly. Append the following paths to the common.loader property in /etc/tomcat7/catalina.properties in your favourite editor. A word of warning here: this is a global configuration change meaning Railo will be loaded on all of the Tomcat sites. Please refer to the Railo documentation if you'd like to be able to run Railo on a per-site basis. OK, it's time to decide on the domain for your new site. For the sake of this tutorial, say it's going to be mysite.dnsd.info but be careful here as you want to pick one that's actually available. Other domains offered by DNS Dynamic include dnsd.me, dnsdynamic.com, dnsdynamic.net, dnsget.org, user32.com and x64.me. No, they are not quite as neat as a simple .net or .co.uk but you still have quite a few to choose from. What you need to do now is work out what your current public IP is using a site like http://whatismyip.com/, register a free account on http://dnsdynamic.org/ and set up your domain pointing at that IP address. The chmod command above will make sure any file created within the html dir will automatically belong to the tomcat7 group and will be fully writable by the owner and members of this group. If you believe this is not safe enough, feel free to customise the permissions. Why don't you edit index.cfm and slap a “Hello World”, <cfoutput>#Now()#</cfoutput>, <cfdump var=”#CGI#”> or something equally useful onto it so we can prove in a moment CFML is actually parsed? Please note, this will need to be removed once the DNS Dynamic setup has been completed though. Now, there's a caveat here: this operation might take minutes to complete on Raspberry Pi (perhaps something to bear in mind if you need to restart Tomcat in the future). When it's in progress, it's worth monitoring the java process memory consumption with tools like the Unix top. Typically, it takes more than 90% of CPU until all Java classes are compiled and Tomcat is ready. Lighttpd stores its basic configuration details in /etc/lighttpd/lighttpd.conf. What we need to do here is register the .cfm index file and make sure the Web root is correct. First of all, let's open up the config file in your favourite text editor and take a look at the server.document-root setting and ensure the path specified there points to your Web root, in my case /var/www (without trailing slash). Lastly, add index.cfm to the index-file.names list, preferably after index.html. What this does is it creates a 10-simple-vhost.conf symbolic link under /etc/lighttpd/conf-enabled. We now need to edit this file and make sure Lighttpd looks at the same Web root as Tomcat does which in our case is /var/www. Voilà! We have reached another milestone and we should now be able to access any non-ColdFusion resource on our site on port 80. What we have at this stage is both the Lighttpd Web server and the Tomcat application server handling our mysite.dnsd.info hostname and looking for files under the same location. Lighttpd doesn't know what .cfm files are but we can try and see if it serves .html files correctly. Let's drop a sample test.html file under /var/www/mysite.dnsd.info/html, put a Hello-world in there, restart Lighttpd and fire it up in a Web browser. When you hit http://mysite.dnsd.info/test.html in Chrome, Firefox or any other browser, you should now see your hello world page. Now that we have both servers up and running, let's make sure all static files like .html, .js, .css and others are handled by Lighttpd leaving only the heavy CFML processing to Tomcat and Railo. This is basically an equivalent of the mod_jk module used in the Apache world. If you reload Lighttpd now you should be able to access your sample CFML template on port 80. Try browsing to http://mysite.dnsd.info/ or http://mysite.dnsd.info/index.cfm and you should see the Railo hello world page you've created before. You should also be able to access the Railo administrator consoles under http://mysite.dnsd.info/railo-context/admin/ without the need to specify the 8080 Tomcat port number in the URL anymore. Do remember we are building a public-facing machine here so this is a good moment to set some hard-to-guess passwords for the Railo web and server admin consoles. 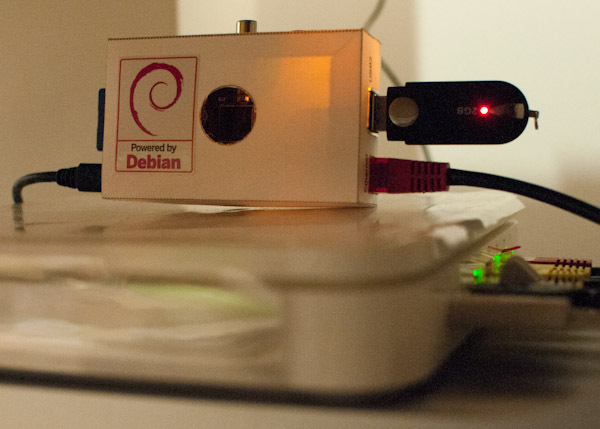 get the router to redirect the Web traffic to Raspberry Pi. If you don't have the curl package installed you will need to get APT to give you a hand with this. If you take a closer look at the Web service URL invoked using curl, you'll notice you don't even have to worry about providing your current IP as DNS Dynamic works it out automatically based on the origin of your request. # Where do we want to cache the current external IP address? # What IP address checker Web Service do we use? Please note, it should only return the IP address in plain text. echo "INFO: Creating the $ip_cache file"
# What is my current external IP address? # Is it different from the one we saved last time? echo "INFO: Your IP hasn't changed since last time"
echo "INFO: New IP empty, skipping"
echo "WARNING: IP has changed by could not cache it as file is not writable"
# We are still here so this means we need to save the new IP address. Just make sure we substring() the IP. In this example we are relying on ifconfig.me but you might as well opt for other services like ipecho.net or icanhazip.com. This particular one will run only six times during the day so you will most likely want to increase the frequency of this scheduled task. Refer to the cron documentation if you're not familiar with crontab`s syntax. And that leaves us with the last task before we can wrap the whole thing up. What you basically need to do is instruct your router to forward all Internet traffic on port 80 to the local network IP of the Raspberry Pi box on the same port number. Be careful though as this is where things are getting a bit dangerous as your newly set up Web server is hereby going live! You are therefore responsible for making sure the box is secure and well protected from any malicious stuff hiding in the depths of the Internet. For detailed instructions on how to configure port forwarding you might need to refer to your router's documentation. But if you happen to use TimeCapsule, all you need to do is fire up AirPort Utility, select your device and click Edit, then go to the Network tab and hit the plus icon under the Port Settings section. In the pop up window you then need to enter the “Private IP Address” that is the IP of your Raspberry Pi (in our case it's 192.168.1.7) and set public and private TCP ports to 80. Just to confirm, I also set it all up using the admin interface provided by the BT Home Hub (if you are based in the UK, you probably heard about it) in the past and steps required to configure it were pretty much the same. And last but not least, go back to your hosts file and comment out the domain entry that we hard-coded before as it's no longer needed. This is it, your new CFML site is now live - just don't forget to let the world know what the URL is! PS Many thanks to Adam for kindly agreeing to host this guest blog post.